Playwright Martin McDonagh breathes unabashedly obscene, new life into the overly familiar mismatched-buddy formula with "In Bruges," a comedy about hit men sent into hiding in the quaint Belgian town. Colin Farrell and Brendan Gleeson are clearly having a blast reveling in the rapid-fire rhythms of McDonagh's politically incorrect dialogue, their deadly profession a sharp contrast with their fairy-tale surroundings. Ralph Fiennes tears it up, too, as their brash boss. They play off each other with ease and relish, especially as the situations they find themselves in become increasingly absurd. An American actor on a movie shoot - a dwarf with a penchant for drugs and prostitutes played by Jordan Prentice - turns into a central figure. That's why it's such an enormous letdown when McDonagh, directing his first feature, resorts to action-flick cliches in the film's overblown conclusion. A heralded British playwright of Irish descent who's had hits on the Broadway and London stages ("The Lieutenant of Inishmore," "The Beauty Queen of Leenane"), McDonagh won an Oscar in 2006 for his live-action short "Six Shooter," which also starred Gleeson. Although his writing calls to mind both Quentin Tarantino and David Mamet, he's an engaging, original young voice. "In Bruges" knocks you over with its initial energy, then turns intriguingly darker as Ray finds himself incapable of escaping the guilt he feels over the hit that went horribly wrong - his first and last - which forced him and his partner, Ken, to lay low. The twisted, violent images in the Bosch painting he and Ken ponder at a museum suddenly take on deeper meaning, and force him to consider feelings of fear and remorse he never knew he had. Farrell gets the showier role of the two, digging deep for the emotional scenes and even getting a chance to flirt a bit with a pretty local girl (Clemence Poesy) who sells drugs to the actors on the movie set. Gleeson, meanwhile, exudes an effortless calm and quiet strength - you could just look at that fascinatingly weathered face all day - especially when Ken is given a particularly unpleasant assignment. And while Fiennes further shakes things up as London crime boss Harry (pronounced 'arry) - an unusually thuggish role for the two-time Oscar nominee - his arrival in Bruges (pronounced broozh) also marks the film's undoing. McDonagh relies too heavily on foot chases and shootouts through the town's cobblestone streets; things turn way too obviously bloody, almost cartoonishly so. One character dies with a splat, another with a bang. And it's all smothered in an overbearing score from longtime Coen brothers collaborator Carter Burwell. "In Bruges" is a wildly imperfect feature debut, but it does make you curious to see what else McDonagh has to offer. 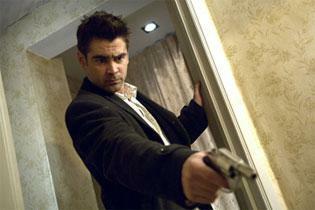 "In Bruges," a Focus Features release, is rated R for strong bloody violence, pervasive language and some drug use. Running time: 107 minutes. Two and a half stars out of four.